I’ll start sharing this classic American kitchen with you by asking, wouldn’t you love to cook here? How dreamy would that be! 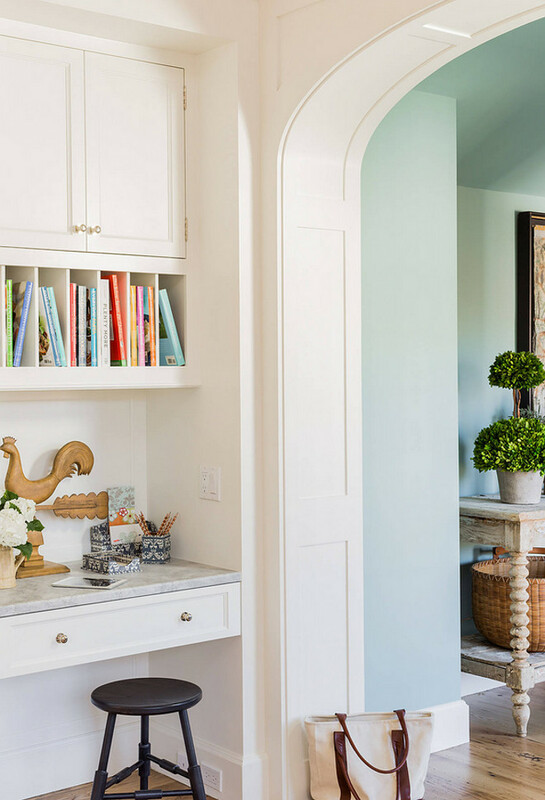 When interior designer Nancy Serafini, from Nancy Serafini Interior Design, and her husband decided to move from Boston to the the scenic island of Nantucket, Massachusetts, they decided that updating their 1960s beach cottage would not resolve all of its foundation problems and building a new beach house would fit their needs better. 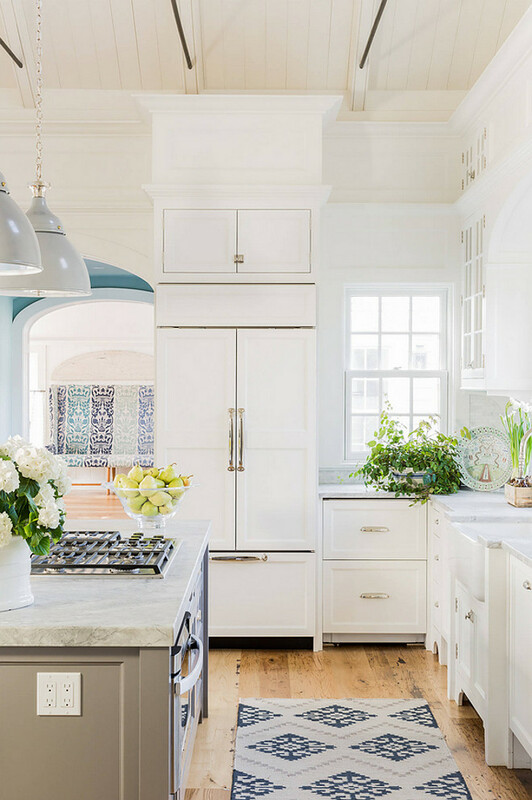 This was the opportunity this talented designer was waiting to design her own dream coastal style kitchen and, in this post, you’re be able to get all of the details, from paint colors to lighting, flooring and even the floor plan with dimensions! It’s time to get inspired! 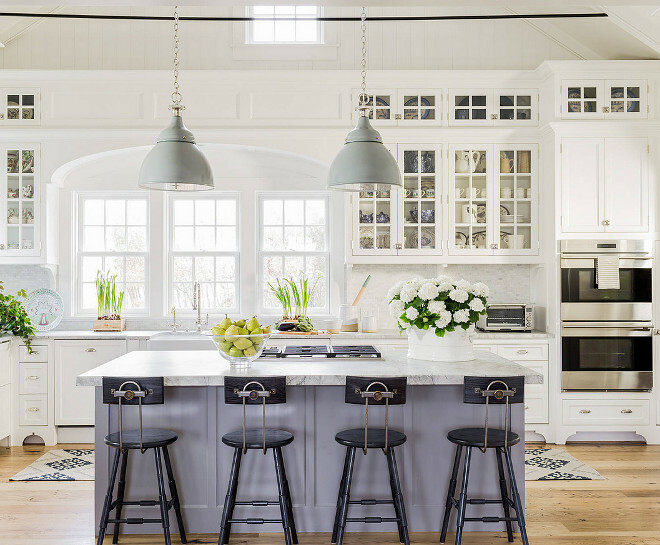 This classic coastal kitchen features a fresh color palette with soft grays and off-white cabinets and walls. 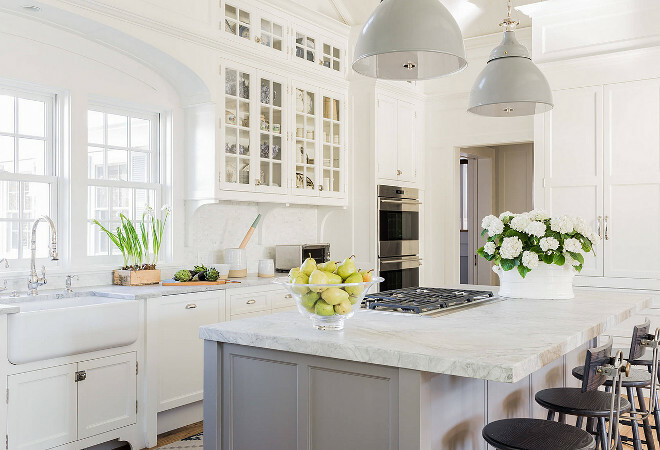 Although sophisticated, this kitchen feels warm and family-friendly. 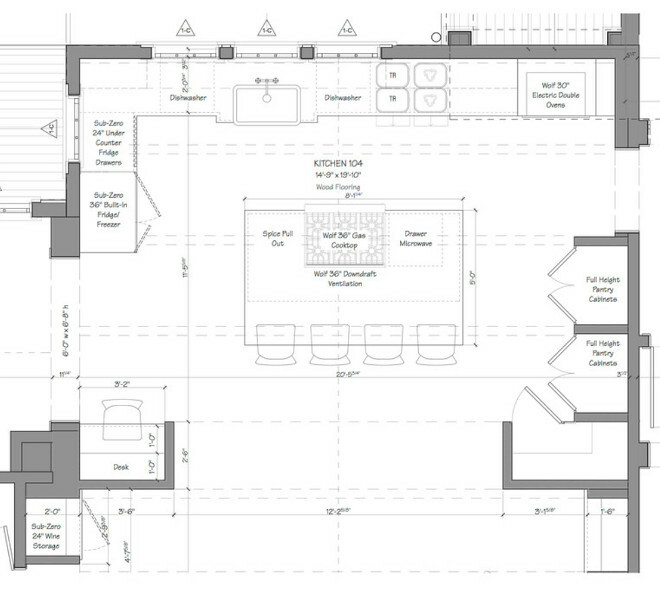 Kitchen Dimensions: About 315 square feet. The ceiling is about 14 feet high! 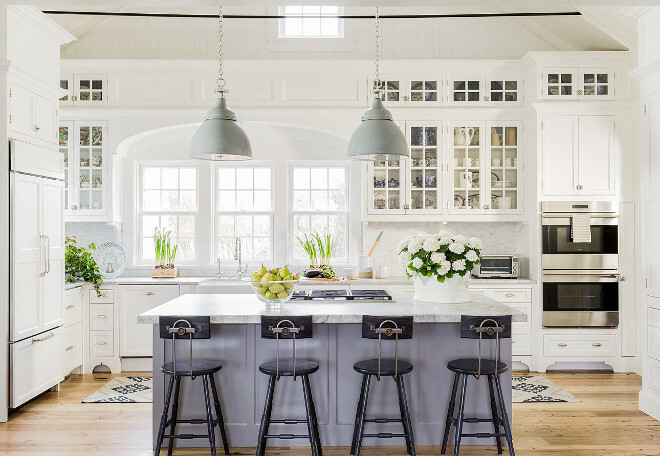 White and Grey Kitchen Paint Color: White kitchen cabinet paint color is Benjamin Moore White Dove and the grey kitchen island paint color is Farrow and Ball Soft Moodiness. The cabinets were custom-built by Peter Culbertson, Madaket Woodworkers. 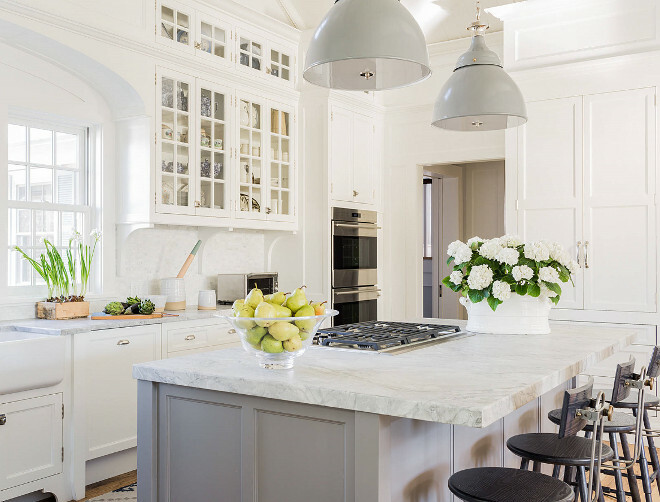 The kitchen island features 2-inch-thick Super White leathered quartzite countertop. Accoding to the designer, “the leathered finish is different than honing and gives it a bit more texture and feels wonderful under your touch.” The island also features a 36-inch gas cooktop with a 36-inch downdraft vent. 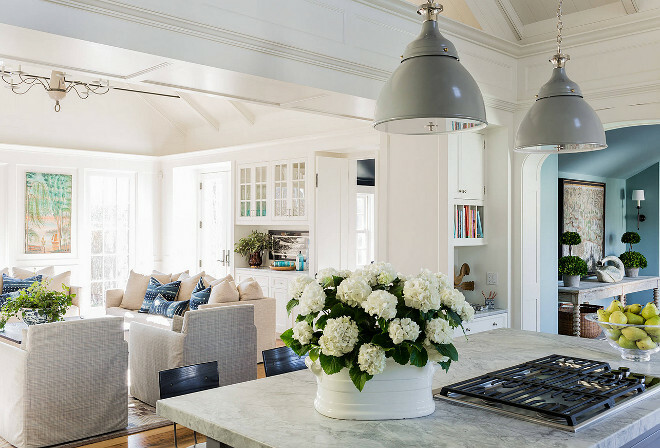 The large-scale pendants over the island create a warm focal point. The island pendants are Rover Light from Ann-Morris in New York. The stools are navy blue painted oak and steel and they are from O&G Studio in Rhode Island. 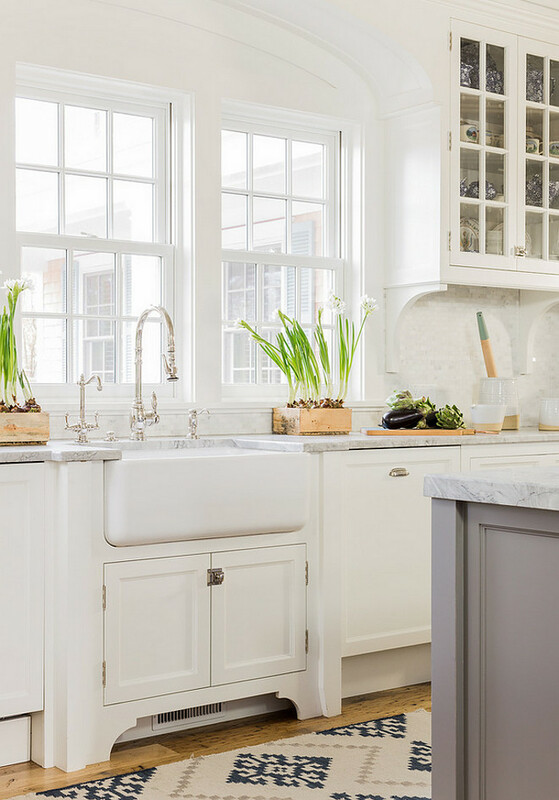 A white farmhouse sink, by Rohl, sits under casement windows that allow lots of natural light inside. The backsplash is a medium brick Calacatta marble tile. A thin closet to the right of the ovens holds a step stool the owners use to reach the items in the upper cabinets. Cabinet Hardware: 743-PN, 744-PN, 745-PN, 746-PN from Schaub & Co. 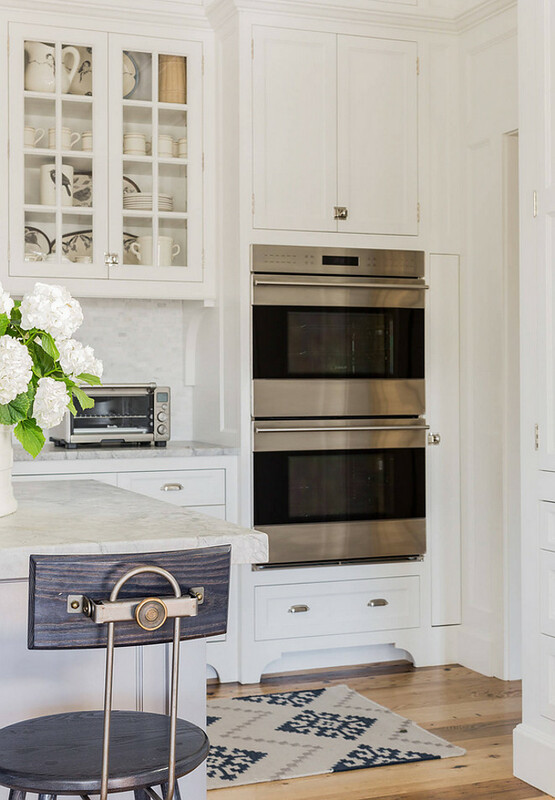 The kitchen features a paneled 36-inch built-in French-door-style refrigerator and freezer. To the right, the paneled undercounter refrigerator drawers hold beverages. 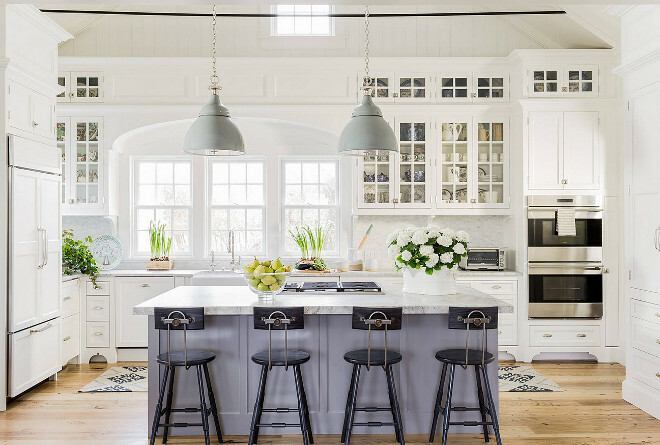 Above, the decorative black cables seen in the open ceiling take the place of traditional wood beams and give the space a fresh design. Paneled Refrigerator & Refrigerator Drawers: Sub-Zero and Wolf. Kitchen Flooring: Kitchen floors are reclaimed antique chestnut floors, salvaged from a Connecticut barn – no stain. Here we see the molding detail that gently frames the top of the pantry and surrounding cabinets to give the kitchen a customized look. This photo shows the desk area next to the entry hall and the open floor plan that creates an easy connection between the kitchen and adjacent family-living room. The inviting kitchen is off the entry hall and opens to a bright and comfortable family room. As this floor plan shows, the simple but well-detailed layout makes everything accessible and encourages good traffic flow between spaces. Interior Designer: Nancy Serafini Interior Design. Photos by Michael J. Lee Photography. Architect: Thomas P. Catalano, Catalano Architects. Builders: Les Fey Woodworking and Will Gorman, construction supervisor. 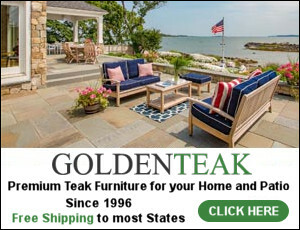 Custom Cabinets: Peter Culbertson, Madaket Woodworkers. Tuesday: White Cape Cod Beach House Design. 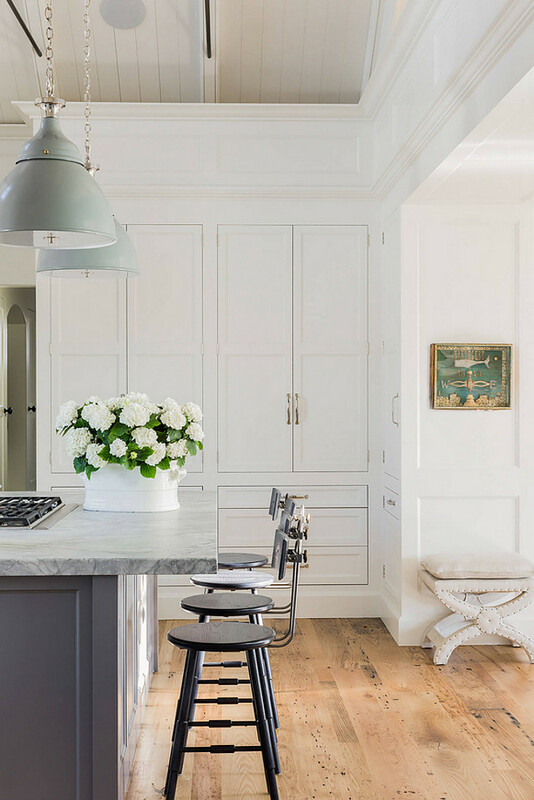 Shingle Style Home with Casual Elegant Coastal Interiors. I hope this kitchen post comes to give you some ideas. 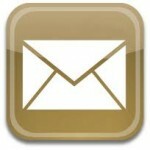 I’m getting a lot of people requesting about my Online Interior Design Services lately. 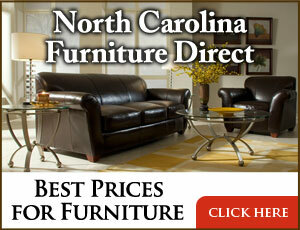 Spring always inspires us to finally get our interiors the way we have envisioned for the entire winter! Have a Blessed day, everyone and we’ll talk again tomorrow!